It should come as no surprise that feelings of anxiety are common place among members of our elderly community. In many cases, their excessive concerns are based on diminishing independence, shrinking social circle, body strength, balance and overall health. Many seniors struggle with the loss of their independence, or become isolated at home or in a senior retirement residence or supportive living environment. Most seniors combat mobility issues or suffer from such health conditions as cancer, dementia, diabetes, heart disease and Parkinson’s disease, to name only a few, so you can imagine the frustration and anxiety that all of these factors have on a seniors well being. You’d be hard pressed to find any medical professional who doesn’t champion the act of exercising. For seniors who cope with anxiety, calming exercises can be very relaxing. Breathing exercises are especially helpful. Encourage your elderly loved one to practice taking slow and even breaths to help minimize their anxious situations. As well, get him/her to try some light yoga or tai chi. Going for walks is also a great way to get in some stress-reducing exercise. As we alluded to earlier, anxiety is common for people with dementia. Forgetfulness can not only invoke senses of fear, but embarrassment as well. Especially if your elderly loved one has dementia, it’s best to create regular routines that will promote better memory. Predictability can be very calming. If the senior in your life is aware of what is to come, it will help to diminish his/her fear and anxiety. For many seniors, getting up in the middle of the night to use the bathroom is a common occurrence. This is especially true for individuals who battle with mobility issues. With safety being a concern, many seniors become restless and fearful at night. To help your elderly loved one experience a more restful sleep, assure him/her that help is nearby. If a caregiver can’t be immediately available, provide such daily living aids as a bedpan near the bed in the event of an emergency. In other cases, the installation of bed rails may be necessary to help prevent falls. Loneliness is also a major culprit for anxiety in seniors. Especially for those who are widowed, being alone can result in severe emotional hardships. Providing companionship by way of creating a social network of individuals who can spend time with your elderly loved one is a great way to ease the stress. It’s always helpful to have someone to talk to. 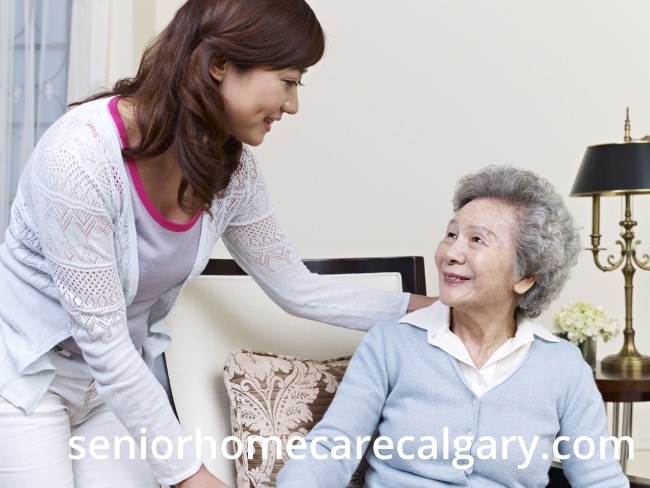 When all else fails, it’s best to place the needs of your elderly loved one in the hands of a home care professional. The Senior Homecare by Angels team proudly provides personalized service that is built around the needs and peace of mind of the families we serve and of course their loved one. We have a lot of experience working with families to develop tailored care programs that work with their elderly loved one’s schedules, while maintaining a regular and consistent caregiver. If you have any questions, please don’t hesitate to contact us in order to ask them! We are available to answer your questions 24 hours a day, 7 days a week. You may call us at 403-862-0129 or toll-free at 1-877-209-6142, if you are outside of Calgary. You may also visit our Contact Us page to complete and submit a simple contact form to have us contact you.